My beautiful little girl – You will never know what you mean to me and daddy. You are what keeps me going in the morning. Your smile reminds me so much of your brother. I know he picked you for us and I know that every day he watches over you and protects you. He loves you just as much as daddy and I. I want you to know you have the world at your fingertips. You are so smart at 9 months and I know you will go sooo far and me and your dad will be there every step of the way, rooting you on! Never give up on your dreams and NEVER settle. You truly have blessed me. Thank you for letting me be your mom! 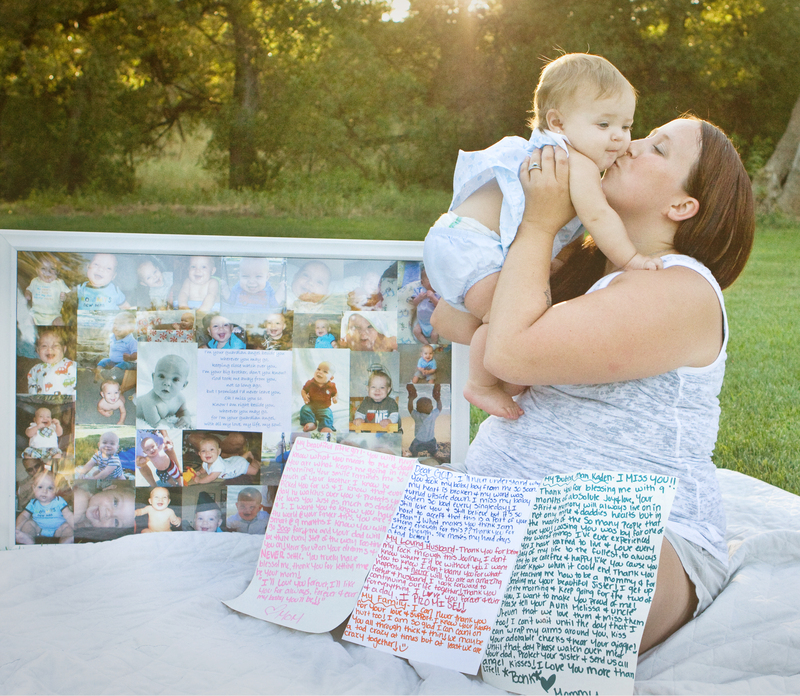 Dear God – I’ll never understand why you took my baby boy from me so soon. My heart is broken and my world was turned upside down. I miss my baby Kaden so badly every single day! I still love you and still believe, but it is so hard to accept that this is a part of your “plan”! What makes you think I am strong enough for this?? Thank you for Lexie, though. She makes my hard days a tad better! My Loving Husband – Thank you for being my rock through this journey. I don’t know where I’d be without you. I want you to know that I don’t blame you for what happened and never will. You are an amazing father and husband. I look forward to continuing our life together! Thank you for everything. I love you forever and ever and a day, I PROMISE!! You know my heart breaks for you everytime I see you sad about Kaden. Lexie is such a lucky girl to have a loving supportive family and an angel watching out for her. I love this picture! Sarah, you have a gift. Thank you for sharing your very personal story of love, tragedy, strength and faith. Your are an inspiration. I’m speechless. Sarah is a very brave woman.